One state’s bold early move to close the childhood word gap, and what happens if it succeeds. Airon Pate is bouncing off the walls. 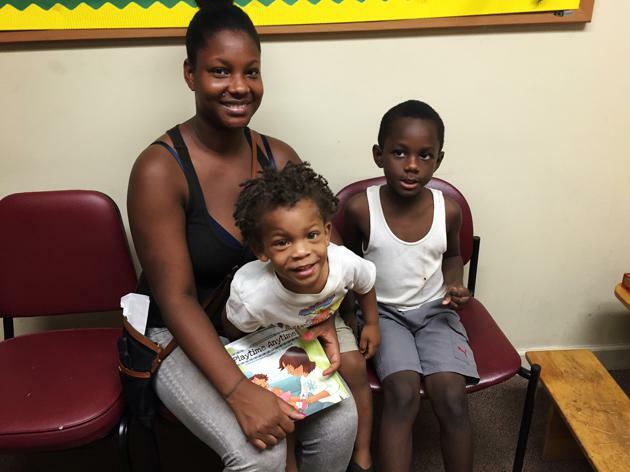 The not-quite-2-year-old is waiting with his mom Dominique and brother Aiden, 4, to be seen at a federally subsidized clinic for low-income women and children here in Macon, Georgia, and sitting still is not in his repertoire of tricks. Over there to play with a toy. Up on the child-sized table wedged into the corner. Across the room to touch base with Mom, chattering the entire time. The constant babble exhausts Dominique, 25, but thrills the clinic nutritionist charged with implementing a relatively new statewide effort to get parents to talk to their babies. Called simply “Talk With Me Baby,” the program is a multifaceted attempt to fill the massive 30 million-word gap between children from lower- and upper-income families by making sure that babies from all backgrounds hear lots of words. Research suggests that poor children hear about 600 words per hour, while affluent children hear 2,000. By age 4, a poor child has a listening vocabulary of about 3,000 words, while a wealthier child wields a 20,000-word listening vocabulary. So it’s no surprise that poor children tend to enter kindergarten already behind their wealthier peers. But it’s not the poverty specifically that holds them back—it’s the lack of words. In fact, the single-best predictor of a child’s academic success is not parental education or socioeconomic status—it’s the quality and quantity of the words that a baby hears during his or her first three years. Those early years are critical. By age three, 85 percent of neural connections are formed, meaning it’s difficult for a child who has heard few words to catch up to his peers once he enters the school system. While the word gap might sound like an education problem, the health consequences can be dire—and the benefits of eliminating it can be immense. Public-health officials in Georgia recognize this. Children with more words do better in school. Adults who were good students and earned a college degree have longer life expectancies. They are at a lower risk for hypertension, depression, and sleep problems. They are less likely to be smokers and to be obese. “There is no way we can separate health and education,” said Dr. Jennifer Stapel-Wax, director of infant and toddler clinical research operations at the Marcus Autism Center in Atlanta, and the self-described “chief cheerleader” for the effort. So in Georgia, from the governor’s office on down to nurses and WIC (Women, Infants, and Children) clinics like the one the Pate boys visited in Macon, the solution and the message are clear: Talk with your baby (and help improve the state’s well-being). That second part is not touted much, but doctors and nurses behind the campaign hope that by engaging parents in the first part early and often, the second part will follow—and they can alleviate the need for costly interventions down the line. Speak to your baby while you’re pregnant because yes, she really can hear you in there. It might seem awkward to talk to an infant who does not talk back, but watch closely. She’s actually responding. Tell her about what you’re making for dinner, what you’re doing when you’re getting her dressed, and where you’re going as you load her into the carseat. See how she stops sucking that pacifier while you talk, or how she locks eyes with you? Those are signs that she’s listening, and she understands a lot more than she lets on. Does your baby gurgle or coo back when you talk? That’s classic “serve and return” and it’s a critical sign of brain development. Nurses in Georgia have known all of this for years. But they hadn’t necessarily been passing the message along to parents. Until now. Back at the clinic in Macon, a Talk With Me Baby informational video plays on constant loop in the waiting room. Down the hall, Dominique says she was not read to as a kid, but there are books for Aiden and Airon at home, and if it hasn’t been too busy a day, they read at night. “I expected to have to tell him ‘Go get a book,’ but he does it,” she said of her youngest. Her oldest, she said, will grab a book and make up his own stories. The trio goes to the library, she said, and she rents Elmo DVDs to watch together. They don’t usually check out books, she explained, because there are already books at home. Dominique, who said she couldn’t secure her son a spot in Head Start, the federal early childhood program for low-income families, is home full-time with the children. As the WIC nutritionist offers information about nutrition and vaccines, he will also assess and respond to her comments about how she reads and talks with her boys. He will reinforce the importance of language nutrition, the term Talk With Me Baby uses in place of the negative-sounding word gap. It’s a good thing that Aiden is making up his own stories, he might say. He might also gently add that checking out new and different books at the library to go along with the DVDs is a great way to keep both boys interested in reading. “We need to sensitize parents to baby speak,” Stapel-Wax said. As one prong of Talk With Me Baby, a curriculum for nursing students has been developed and nurses in the Atlanta metro area are being trained to communicate to parents the importance of talking to babies. That they are the ones delivering the message is a carefully calculated fact. Again and again, nurses top the list of most trusted professionals, ahead of medical doctors, clergy, and certainly politicians. At the same time, Talk With Me Baby has already been deployed to the state’s nearly 200 WIC clinics, where WIC nutritionists are its champion. The idea is to reach all Atlanta-area newborns, regardless of family background or income, by 2017 and all newborns in the state by 2020. Fitzgerald says the state is on track to reach those goals. It’s too early to tell the real impact of the program, but initial evaluations are being conducted. The goal—as Arianne Weldon, director of Get Georgia Reading, one of the campaigns spearheading the program, put it—is to embed the systems that already reach most babies in a sustainable, scalable way. WIC clinics see more than 80 percent of low-income parents and their children, and nurses see virtually all babies in Georgia. A third of the state’s toddlers are enrolled in some form of early-childhood education. While there have been some costs up front, the idea is for the messaging to become part of the very fabric of the services that nurses, nutritionists, and early childhood care centers throughout the state offer. “Talking to your baby doesn’t cost [parents] money,” Fitzgerald said. Right now, Georgia is the only state taking such a coordinated, widespread, public-health-focused approach to reducing the word gap. There are more isolated efforts in places like Chicago and Providence, Rhode Island, but they operate on a much smaller scale. She and others spearheading such efforts can go into potential funders and say, "here are the brain scans, here is the science behind why this is critical." In mid-August, the U.S. Department of Health and Human Services Office of Minority Health awarded $200,000 a year for up to five years to Georgia’s health department to, in part, support language nutrition through Talk With Me Baby. “The expectation is that there will be ways to continue what we’re doing,” Stapel-Wax said. If Talk With Me Baby is successful, Fitzgerald expects to see other statewide programs take shape. There are certainly people watching, from state health officers in California and Indiana to academics at the University of Kansas. The White House has issued a “call to action” to reduce the word gap, spotlighting the Georgia program specifically. And the Clinton Foundation has launched “Talking is Teaching” through its early childhood Too Small to Fail campaign. “I think this is probably the most important work we’re doing right now,” Fitzgerald said, a pretty big statement from the state’s top health official about a program that from the outside doesn’t even look like it should be about public health. While, as Stapel-Wax noted, Talk With Me Baby might sound like a program you’d expect to find in Massachusetts or New York, the fact that it’s happening first in a state like Georgia doesn’t surprise Fitzgerald. “It has strong support because this is not a Band-Aid,” she said. Multiple people interviewed for this piece relayed stories of Republican Gov. Nathan Deal’s wife, Sandra, gushing about the program on visits to hospitals. If all goes as planned, the team behind the campaign hopes to get a lot more people talking—most importantly, babies.